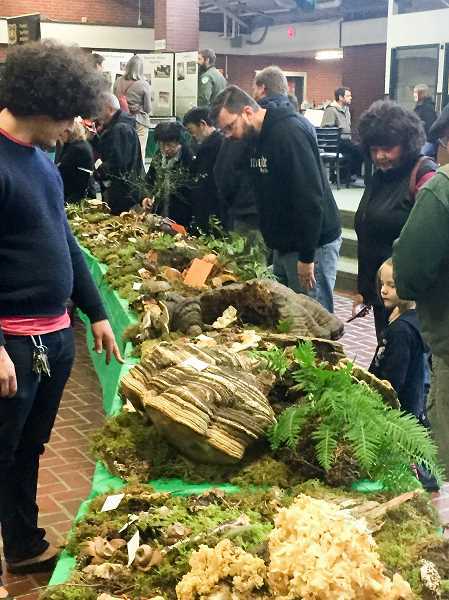 An upcoming Estacada tradition will highlight the many ways to have fun with fungus. The eighth annual Estacada Festival of the Fungus, 11 a.m. to 4 p.m. Saturday, Nov. 3, will connect attendees with mushroom-inspired activities and art. The event will take place in the Estacada High School commons, 355 N.E. Sixth Ave.
Central to the festival is a display featuring numerous mushrooms and other fungi from the area, collected by the event's organizers. "I love watching people's faces light up when they look at the mushroom display," said Nolene Triska, president of the Estacada Fungus Association. "Little kids have their hands on the table and are peaking over. . .I love seeing guys grab their wife's arm and say, 'Honey, look.' It turns grown people into kids." There will be several additional ways to interact with fungus during the gathering. Members of the Oregon Mycological Society will be available to identify species and there will be demonstrations featuring truffle dogs and mushroom fermenting. Mushroom growing kits will also be available for purchase. Children can create cardboard mushrooms or assemble wooden scenes and engage in fungi-related coloring. A group art show will highlight mycological-inspired creations, and those interested in having work featured should contact the association at www.estacadafungusassociation.org. The fungus-related fun will also spread to other spots in Estacada. The Spiral Gallery, 341 Broadway St., will have related art on display, and several local restaurants will offer mushroom-themed dishes, including Andele Andele, the Viewpoint, Hitchin' Post Pizza and Eagle Creek Saloon. Event organizers estimate that the festival draws about 500 attendees, some whom travel from out of state. Admission is $5 for those 12 and older, and Estacada School District students are free with identification. What: Estacada Festival of the Fungus. When: 11 a.m. to 4 p.m. Saturday, Nov. 3. Where: Estacada High School commons, 355 N.E. Sixth Ave. Cost: $5 for those 12 and older. Estacada School District students are free with identification.